We've been having the annoying light drizzle all day. 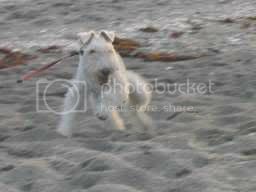 Even tho I got my morning park walk, I didn't get my beach walk in the afternoon. 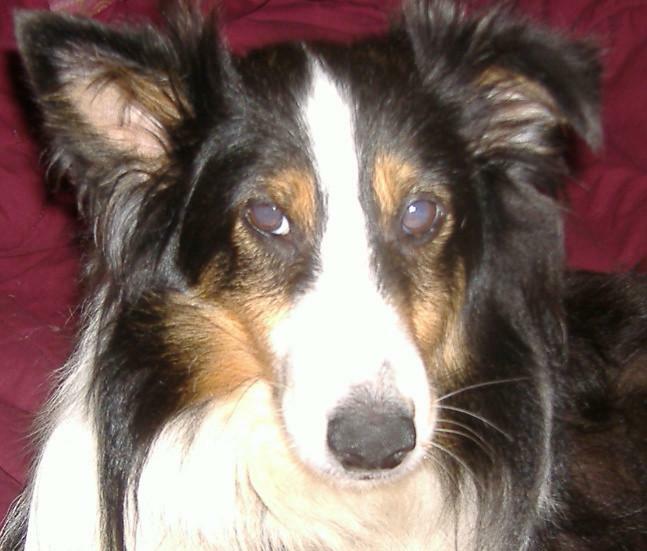 Instead, mum came home from work and drove me to my favoritest pet store in the whole wide world - Super Pets!! 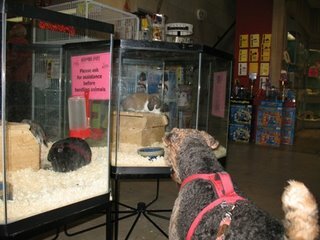 The staff at Super Pets love me because they think the way I "watch" these little critters without making any noise is just hilarious. They call me " The Bunny Lover Dog"! Sigh..... maybe I'll wish for another bunny on my coming up birthday. It worked last year, and I got Georgie! Maybe it will again this year?? 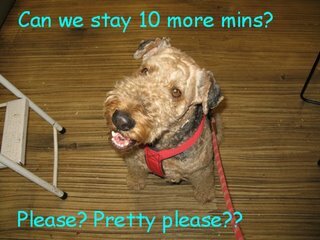 Mum, you listening?? This is a video of me doing more convincing........I got a little distracted and a little excited towards the end. You all must be wondering how I could communicate with the black rabbit. Well, I spoke "Bunni-an" to him. 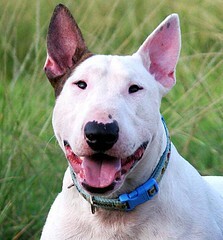 You see, when you are born a terrier, you are naturally ingrained with the ability to speak "CRITTER". "Bunni-an", "Rodent-ian", and "Avian" are just part of the many dialects of "CRITTER". As you can see from below, I've had to use all three of the above dialects today. I thought I saw our DWB's honorary member - Fufu and got all excited........ but that little guy laughed at my innocent question. 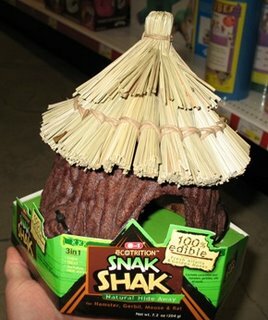 Oh hey Fufu, mum and I found the coolest hut called "SNAK SHAK"!! It is 100 % edible. You can chew on it, snack on it, and even sleep in it!! I love Super Pets' "live stock" section so much so that every time we go there, we are at least there (in that little section) for an hour and a half....... because I totally refuse to leave!! I noticed mum was starting to yawn, which meant she was getting really bored and really tired, and was about to make me leave. BUT, the ungrateful mum and Kelly both said I should just watch!!! Gee... what was wrong with them?? I could clean up those poop in no time, and I could easily make the rats and mice not poop anymore.... Oh well, their loss! I was a little concerned when Kelly was cleaning the hamster cage. 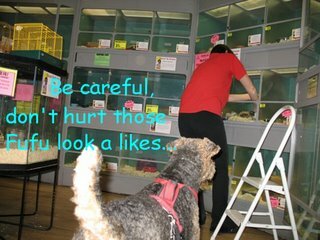 I wanted to make sure she was careful with the hamsters who looked just like Fufu and my Mousie . After I supervised the cleaning process for all the cages, mum once again told me we needed to go. Her exact words were: "Sunshade, we've been here for almost 2 hours, I want to go home!!" 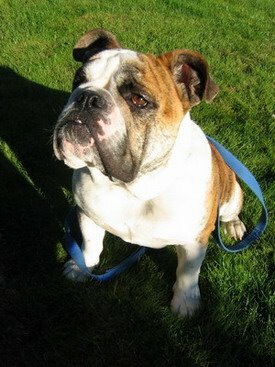 I hope he finds his forever home soon!!! Hi guys, I have had the honor to be the Awesome Blog Winner of October. However, a new king or queen is about to be crowned. So please, come vote for my bestest pals: Buster , Butchy & Snickers , and T-man. I'm thinking of moving out and joining you. You're Mom takes you on the best outtings. I don't get to go nearly as many places. I went everywhere with Mom before the human brothers came along. It is a little harder for Mom to take me now. She still takes me with her whenever she can, but now she also takes turns with the other dogs. But I bet they don't get to ride in the cart like I do at Pet Supplies Plus. ps. Mom says you must live in paradise cause all the pictures are so amazingly beautiful. Way to stand your ground!! :) Those bunnies seemed not to mind you watching them. You have such a pretty smile and cute face that you must've put them at ease. My brother CC-man thought he heard cockatiels chirping in the background. He made a few chirps himself when the video was playing. 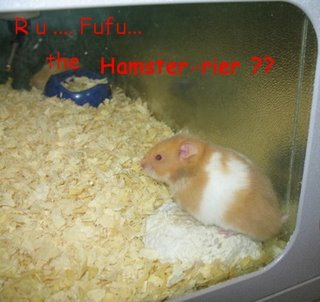 My oh my... that hamsterrier really resembles Fu Fu.. For a moment I thought he'd gone to pay you a visit! 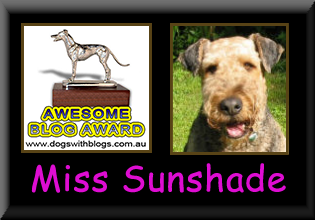 Hi Miss Sunshade! 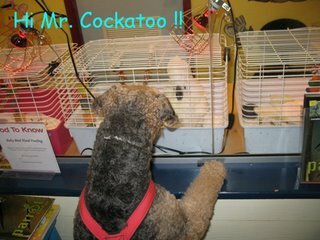 I am just lovin' your video of the bunny, but I would have barked the store down if I had been so darn close to the critter! thanks for your encouragements in my blog! :) HM asked the vet about the painkillers, but they said it's only given when requested or really needed. so HM, being the first-time dog owner and blur woman, didn't even think about painkillers till i was whining fit to shatter glass! Wow that looks like a picture menu wall!!!! Or, as my Mom say, the Horn & Hardart Automat she went to in NYC when she was a kid! 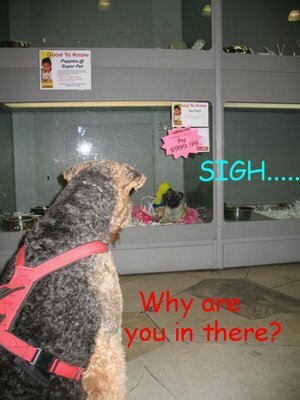 I wish I can go visit this pet shop with you. Seem so much fun. 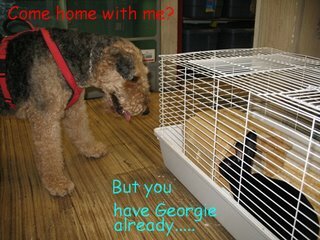 My mom goes to PetsMart everytime she is in the US (the last visit was in Atlanta) and I stayed home. I love SUPER PETS too! Mama hasn't taken me in a while so thanks for posting this. She needed a good kick in the pants! Hey Sunshade, What a great place to hang out in. And you're so nice to all the critters there. 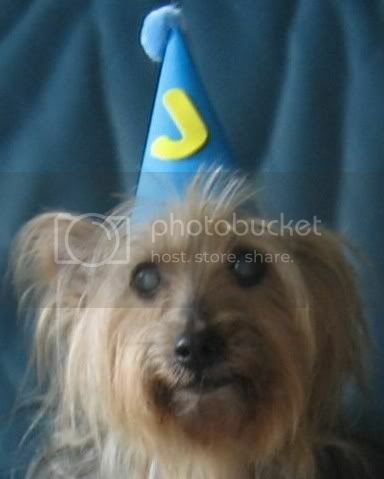 Haa, I hope your mum gets your hint on your birthday present. And the hamster does look like me doesn't he. But he's so rude, how dare he laugh at the Hamster-rier question. i need some pointers from you how to keep your cool while watching those cute little thing in their cage! 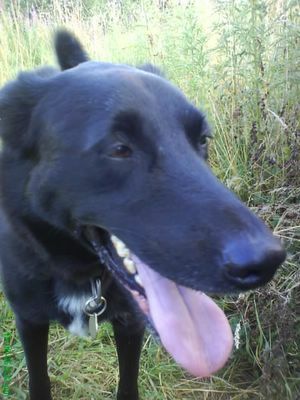 if i ever see anything move, whether it is hooman or animals, surely i'll get all excited and start chasing them. Hi Sunshade, you looked like you had fun. 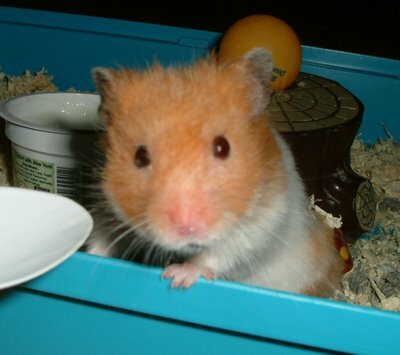 And yes, that hammie looked like fufu. Pity you did not get to see any piggies though! I wish there's a mega pet store here as well so that I can bug my M to bring me there. So bad of the ignorant hamster to laugh at your question. 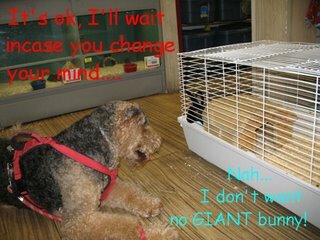 Maybe he's jealous coz he can't be a hamster-ier. I had one of those rabbit things for a few days!! My mom and dad used to live in an apartment and someone put the bunny in the garbage! Can you believe that! So mom brought it to our place until she could find someone who had room for him/her. i love the video of sunshade just sitting there looking at the bunny. so cute! your pictures are the best, sunshade.. and really, you're so pretty.. and photogenic.. gosh, i swear i'm usually more SMOOTH than this since I'm european after all. Well, English - still very dashing!! 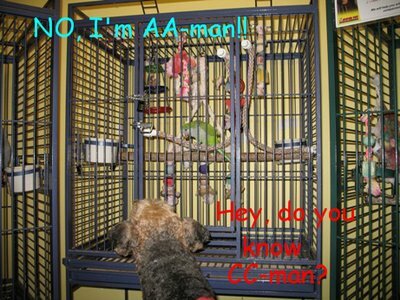 T-man: that's so funny that CC-man started chirping!! 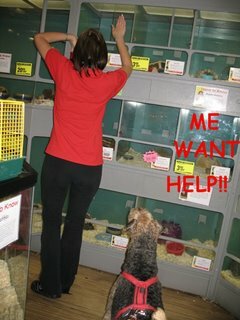 The pet store had all sorts of noises from animals and those hi dog kids LOL. Huskee: I KNOW, I thought Fufu came to visit too!! Thank you for your nice compliment, the photos only look good because my mum has the perfect model who stays in position even when mum's hands were wobbly LOL. Marvin: Uh oh, why is Jeannie in the dark room again?? I hope beta is wroking for you. 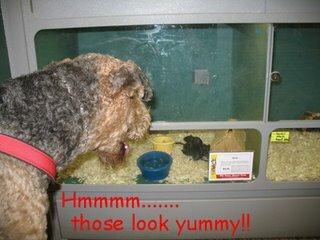 Hehehe....I think you are normal to want to bark at those little critters. The only reason I don't bark is because I get too focused at "Watching" LOL. Chiyo: I love your imagination - watching from outside into apartment buildings!! It was exactly like that, all the critters were minding their own business, and I was peeking from the outside. I'm not sure if it's illegal to take photos, but we know the store poeple pretty well and mum was mainly taking pictures of me (except for the hut to show Fufu). Buster: a picture menu wall...... you are hilarious little man!! Hey ScubaToo: I would LOVE it if you could come her. We can go watch the little critters together. I love to go to PetsMart too when we go to the states, but their menu wall (as Buster put it) does not have nearly as many varieties as SuperPets. Chelsea: Yes, must tell your mama to take you there! You'll have so much fun! 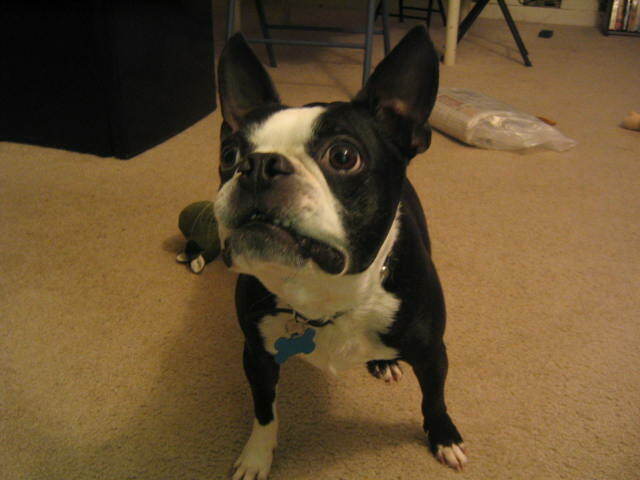 Fufu: what's up with all my blogging buddy look a likes being rude to me?? First it was that blond T-man, and then this Fufu imposter?? 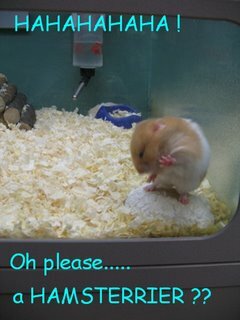 I know you would never be rude to me Fufu, and I also know you are proud to be a hamsterrier!! Booboo: you are just the cutest!! 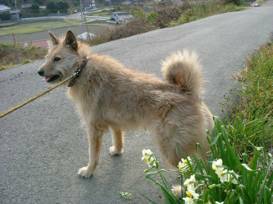 I can so see you trying to chase those little critter with your tail wagging non-stop! Jay: Sigh...I know....I really like to watch piggies too, cause they move so fast in and out of their hide outs!! They are more exciting to watch!! 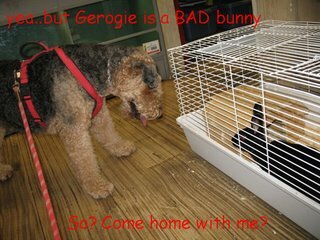 Herbie: I think you are right, he's jealous! 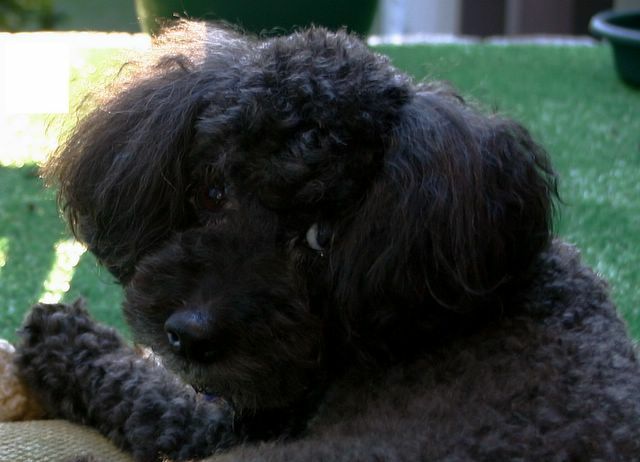 Amanda & Pacco: you are a smart pup Pacco, you go for the readily edible food and treats! Joe and Tanner: WHAT? Somebody put a live bunny in the garbage?? Send the heartless person this way to me!! I'm gonna go check out the story! Hey the Trio: yeah i know what your papa mean, I coudln't understand why that puggie was in the cage. He's not a hamster....and yet he was in one of those boxes. he looked so sad too. Fei & Eve: thanks! I really love to watch bunnies. Everytime I go, I want to bring another one home!! 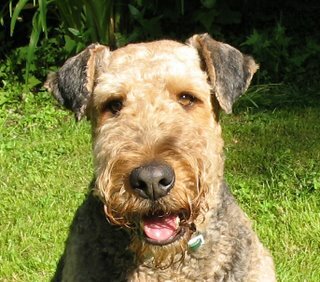 Handsome Dudley: I am so moved by your words - I knew you were British!! Hehe.....you like dust bunnies? oh oh oh, we have a lot of those at home too! *ahem* mum. I am so happy we have yet another Vancouver blogger!! 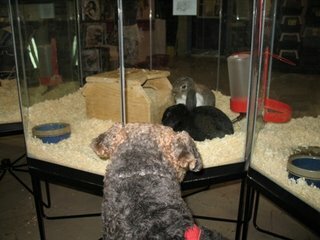 There is the enjoyment by the pet shop on the day of rain. 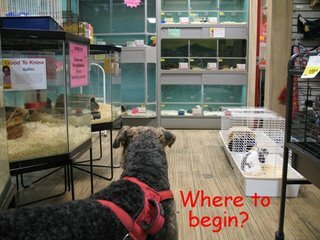 It is a pet shop that seems to be interesting. Especially, it looks at liking rabbits. It is felt that it is longer the enjoyment of ten minutes. Oh, Miss Sunshade, I've missed you. Every time I tried to load your page in the last few weeks, it locked up my computer. So glad you are back and I can read about all your adventures and see the wonderful pictures your mum takes. Vancouver looks terrific.